With half our crew heading back to California, the rest of us prepared to head northwest to San Ignacio. After a quick lunch at Laru Beya, we hopped on our Belize Shuttle that was waiting for us at the Moorings base, the van already loaded with all our bags. We settled in for the three-hour drive. When I was in Placencia 16 years ago, the main road was a very bumpy dirt road, with very few houses. Now the road is paved and there are literally hundreds of houses and several resorts lining the beach. Quite a change! On the way we passed the turn-off to Gales Point, where Susan and I spent several days. Next time I return, I'm going to visit Mr. Gentle's bar if it is still there! We drove through miles of orange orchards and banana plantations and brand new juice-making facilities that are apparently owned by the Mennonites. When we turned on to the Hummingbird Highway the terrain became quite hilly with much more natural vegetation, different to the type we saw around Placencia. As we neared San Ignacio, we realized we were low on rum and as Maya Mountain Lodge doesn't serve liquor we needed to stop and stock up! Troy, our driver graciously agreed to stop at the local market where we loaded up with a large bottle of 1Barrel, the local rum, and a dozen Beliken beers! All set and just five minutes later, Troy deposited us in the lush entrance to the hotel. It felt like home with all the tropical vegetation. 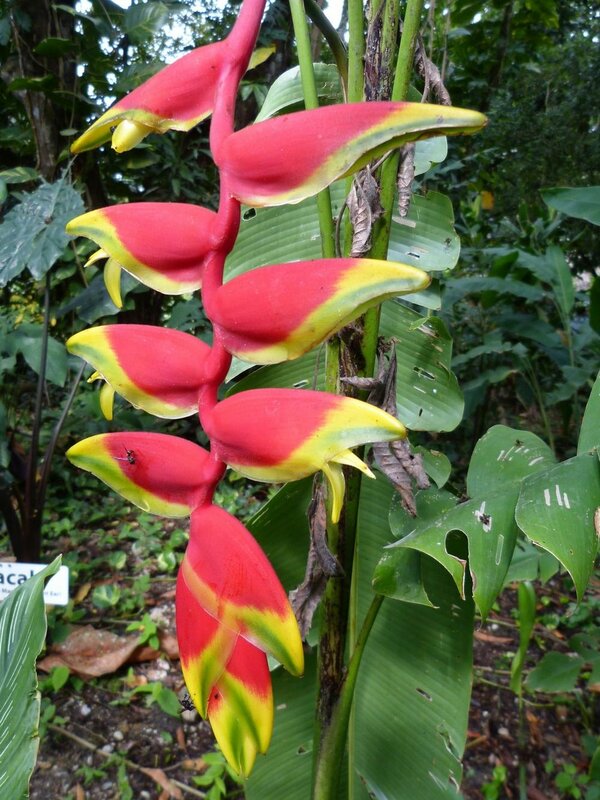 Heliconia of all kinds and a wide variety of gingers grew madly, with philodendron climbing anything they could attach themselves to. Big petria plants, loaded with helicopter flowers, climbed the fences. It so reminded me of Mum's forest where she had so many of these kinds of plants growing. We made it an early night as our plan was to do the Actun Tunichil Muknal (or ATM for short) tour the next day. But it rained in the night and at 6 am, Carlos told us the tour was canceled because the river was too high so the caves were not accessible! Hopefully, if it didn't rain, the water level would have fallen by the next day and we could go then. It would put our tours back to back, with the day trip to Tikal in Guatemala planned the following day, without a lay day in between. So we had a leisurely breakfast in the delightful open-air dining room. With plenty of good coffee and fresh fruit to fuel us, we made arrangements to go into San Ignacio Town and explore. Our own free-form tour. But first, a tour of the grounds with Bart Mickler, who has owned the property for 35 years with his wife Suzi. Part of Maya Mountain Lodge is a Wellness Center and many of the plants on the property are used in the natural healing process as well as in the kitchen! Our walking tour took us through the herb garden with numerous edibles, many used by the local bush doctors, and into the orchard. A lovely stand of papayas caught my attention along with large ginger plants. Bart showed us the Annatto seeds from the Achiote tree used to color the pottery of the area, and for flavoring in cooking. I was very impressed by the way he and Suzi are helping regenerate the use of local plants and vegetables into the Mayan culture. Stay tuned for an article about Bart and Suzi - who Bart describes as "two people accelerating."